The C3G Fund delivered a disappointing return of -6.2% for the month of October. Of course, the global market ‘correction’ presented an environment that left very few places to hide and, comparably, the Fund performed credibly. 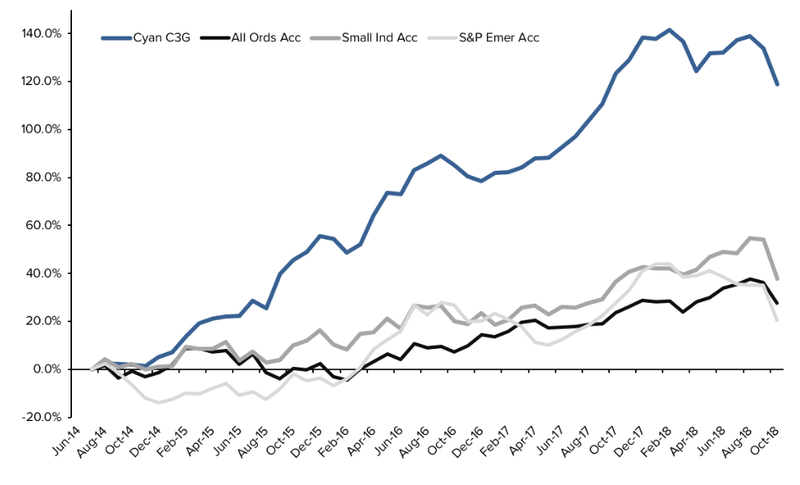 In Australia, the All Ords Accumulation Index fell 6.5%, whilst both the Small Industrials Accumulation Index and the Emerging Companies Index dived 10.6% and 10.9% respectively. The C3G Fund has remained diversified with 24 positions and no individual holding representing more than 5% of the total portfolio. The Fund has also retained more than 35% in cash but we have begun deploy further amounts of capital into new and existing positions as prices have become more attractive. Broadly, the impact of the market correction was felt across the Fund. 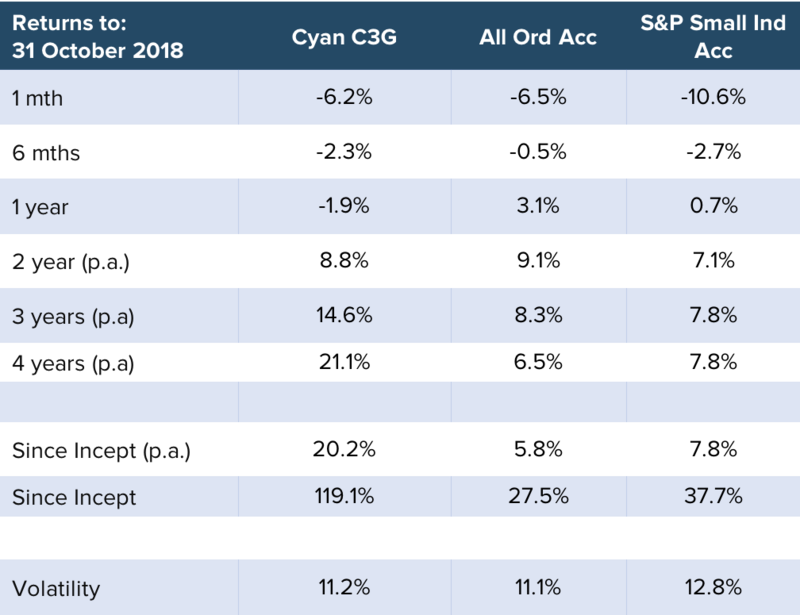 Afterpay (APT) (-30%) was one of the leading detractors (approximately 1% of Fund performance) as the market took to marking down all of the Australian ‘marquee’ growth stocks (Afterpay, Altium, Appen, Xero, Wisetech, Webjetwere all down 20-30%). However post a positive update on 8th November, APT has rebounded around 10%. Readcoud, (RCL) was another detractor (-30%) that accounted for around 0.8% of Fund performance. RCL appears to be performing well operationally but was again caught up in the market sentiment. Like APT, RCL has rebounded more than 15% to date in November. There were around 20 other positions that all fell by various amounts and contributed, in total, around 5% of Fund underperformance. In a number of cases we have increased our investment on recent weakness. The major positive was Freelancer (FLN) that rose 37% in October. FLN’s major, and direct, competitor Upwork https://www.upwork.com/ had a very successful listing on the NASDAQ at the start of October. Despite Upwork being less profitable, it has a market capitalization of US$1.8b versus FLN’s AU$350m which clearly has sparked interest in the FLN story. We added a new position in Murray River Organics (MRG) –https://www.murrayriverorganics.com.au/ is a producer, manufacturer and marketer of certified organic, natural and healthy food products. The company originally listed on the ASX back in January 2017 at $1.30 having acquired and developed valuable strategic assets including land, storage and processing facilities. Unfortunately the original management team did not execute and the share price plummeted. With the original team and Board now gone, the new management team (including experienced CEO, Valentina Tripp) have a clear and simple approach to turning around the business. The $30m capital raising was priced at a significant discount to the net tangible value of the business (10c vs NTA of 16c), such that the company now has the financial firepower and management capability to execute its growth plans and create significant value from its current $68m in sales. In light of the market conditions we wrote 4 ways to cope with this correction for Fund Monitors. Fund Monitor’s profile for Cyan Investment Management is available here. Looking for defensive positions in this market led us to revisit our investment thesis in Kelly Partners Group (KPG) in our How to profit from tax article for Livewire Markets. Markets are driven by sentiment in the short term and value (and value creation) over the long term – but often these forces are conflicted. We continue to have compelling expectations for the companies in which we have invested. As a whole we believe these businesses will grow materially over the next year, and hopefully broader markets are more settled and reward these companies for the growth we expect them to deliver. Markets have stabilised in the short term (at the time of writing), but that aside, we remain committed to our core investment philosophies and sticking to fundamental investment criteria. We continue to spend much of our time meeting with senior management of companies and look forward to reporting the performance of our investee companies and unearthing some new opportunities. We thank all our investors for your support and look forward to keeping you all updated with the Fund’s progress. As always we are contactable in person and encourage you to do so, particularly through the present challenging conditions.